In about two years, physicians may be able to know—more definitively—which patients need antibiotics and which patients do not. Today, doctors often have no way to know for certain. For example, physicians find that blood tests are seldom useful. Most bacterial infections don’t result in bacteremia, the presence of bacteria in the bloodstream. In fact, less than 10% of patients hospitalized for acute infections and only about half of patients with septic shock are bacteremic. If a bacterial infection is suspected but cannot be confirmed, it may well lurk somewhere inside a patient’s body. This possibility, absent any test that could settle the question, may prompt physicians to prescribe a broad-spectrum antibiotic. Such precautionary measures, however, are unnecessary 30% of the time. They also exacerbate the problem of antibiotic-resistant bacteria. Inflammatix looks for patterns of gene expression (predominantly in the white blood cells) as a way of reading the immune system and identifying any pathogen to which it is responding. “We look at the expression levels of host/immune genes, which lets us know if the immune system is responding to viral or bacterial infections, or to nonpathogenic issues such as tissue trauma,” Dr. Sweeney explains. The assays, under the HostDx™ brand, are in early development, and pivotal trials still need to be conducted. But Dr. Sweeney asserts that the sepsis test has 94% sensitivity and 60% specificity for detecting bacterial infections, as demonstrated in a study of 20 retrospective cohorts with more than 1,000 patients. “Gold standard” blood cultures, in contrast, offer approximately 30% sensitivity and 95% specificity. Sepsis is one early target. It is often considered a bloodstream infection, but that is a common misconception, Dr. Sweeney notes. “Sepsis is a dysregulated host response in which the immune system is over-amped in response to any infection,” he continues. “Most infections never enter the bloodstream.” Infections that do not enter the bloodstream pose a somewhat different—and more difficult—challenge than can be addressed by blood-based diagnostics. “HostDx Sepsis is the first test to identify whether patients need antibiotics at all,” claims Dr. Sweeney. “Therefore, it will help doctors get antibiotics to the right patients.” HostDx Sepsis can determine whether patients have viral or bacterial infections, and it can stratify infection severity so physicians can determine whether patients can be safely discharged. It is designed for inpatient use, first in the emergency room and then, eventually, throughout the hospital. The company’s bioinformatics pipeline is relevant for multiple conditions. Inflammatix has identified reproducible gene signatures in tuberculosis, malaria, and dengue fever. It has also been shown to diagnose or risk stratify inflammation in cases of autoimmunity or organ transplant rejection. The approach developed by Dr. Sweeney and Inflammatix co-founder and Scientific Advisor Purvesh Khatri, Ph.D., assistant professor at the Stanford Institute for Immunity, Transplantation, and Infection, used big data and genomics to develop a genetic fingerprint to read the immune system. “It was more successful than we could have imagined,” Dr. Sweeney declares. “At that point, we had finished the research on the presence, type, and severity of acute infections, though we hadn’t yet published the risk stratification part. We realized this needed to be translated to the clinic where it could actually help patients. “No major companies had devices that were appropriate to measure the 30 genes (for HostDx Sepsis) in less than one hour, so we formed our own company to partner with up-and-coming platforms.” The company soon secured funds from DARPA and investments from Khosla Ventures, the Stanford-StartX Fund, and other investors. Inflammatix now has partnered with device manufacturers to develop the hardware for the test, and it has cultivated in-house scientific expertise for assay development. “We’ve gathered a great executive and scientific team, filled with diagnostics industry veterans,” insists Dr. Sweeney. The latest addition, Oliver Liesenfeld, M.D., a global expert on host response to infections disease, joined the staff in January as chief medical officer—the same position he held at Roche Molecular Diagnostics. Although the HostDx tests are designed for healthcare providers, drug developers can benefit by using them to improve patient stratification for clinical trials. “HostDx Fever, for example, could improve the efficacy of some of the novel, broad-spectrum antiviral drugs being developed by properly identifying patients who actually have viral infections,” Dr. Sweeney suggests. Trials involving immune modulation in sepsis also may benefit. “More than 100 interventional trials have been conducted in sepsis, and they’ve overwhelmingly failed. The one immune modulator (for sepsis) that was approved was withdrawn,” he says. Because the sepsis patient population is extremely heterogeneous, he suggests employing a test that could reduce that heterogeneity by identifying patients with infections. The test could also aid prognostic enrichment and the development of sepsis-targeting drugs. Dr. Sweeney estimates that HostDx commercialization is 18 to 24 months away. By the time its pivotal trials are complete, Inflammatix plans to also complete several prospective studies proving (he hopes) the corresponding benefits to patient health and healthcare costs. Prospective interventional trials have not commenced, but multiple research papers have appeared in peer-reviewed journals. These papers confirmed that bioinformatics-based gene fingerprints could be correlated with acute infections and sepsis. The U.S. market for infectious disease assays is approximately 100 million patients per year—about 20 million inpatients and 80 million patients who present as outpatients with infections that are not clearly viral or bacterial, Dr. Sweeney says. According to Dr. Sweeney, these markets likely will be addressed first by host, response screening tests (like HostDx Sepsis) that determine whether a patient needs antibiotics or has a viral infection; then by phenotypic resistance technologies that capture and analyze bacteria from the bloodstream to inform a physician’s chose of antibiotic; and finally, addressing rarer cases, by hypothesis-free infectious testing that analyzes fragments of RNA or DNA circulating in the bloodstream. Initially, HostDx Sepsis will be launched for emergency room physicians. “As more clinical data accrues, it will roll out for the wards and the intensive care unit,” Dr. Sweeney predicts. HostDx Fever will be launched for outpatient use in urgent care clinics and primary care settings such as pediatrician and family practice offices. “It’s a long journey,” Dr. Sweeney says of developing the assay. There’s still much to do and much to prove. In a few years, however, this work just may provide the insights frustrated physicians need to better combat infection. 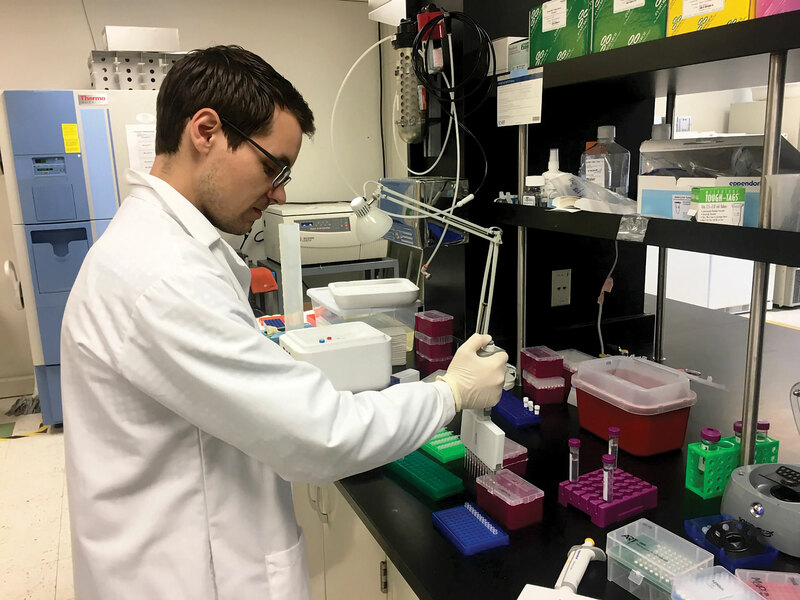 Focus: Inflammatix, a molecular diagnostics company, develops host response–based assays that sift through genomic data to diagnose acute infections throughout the body—not just in the bloodstream—and determine their severity. The Scoop: How Well Are You, Really? Ask the Cloud! Short Stories to Peruse—With Info You Might Use….